In general, an employee handbook sets forth a company’s policies and procedures as they pertain to the employer/employee relationship. It should properly and adequately inform employees of the nature of their employment, company policies and procedures, notices, and employee benefits, rights, and expectations. Many employers have not reviewed their employee handbook and/or do not know the provisions contained in their company’s employee handbook. In many cases, employee handbooks refer to policies that are not practiced in the workplace. Employers and managers should thoroughly review their company’s employee handbook. An employee handbook may obligate managers and supervisors to perform or not perform certain functions. For instance, an employee handbook may obligate employers to conduct regular pay raise reviews. In the event such a review is not provided, an employee may be able to use this information against the employer and/or file a claim for breach of contract. Moreover, an employee handbook may obligate managers and supervisors to make or not make certain business decisions. For instances, an employee handbook may require an employer to provide employees one or more written disciplinary notices prior to termination. Such employers should be careful about terminating an employee who has not received a disciplinary write-up. An employee handbook should be customized to fit the size of a company. As a business grows, employees may be added to payroll. As the employee count rises, so do the laws that apply to the business. For instance, sexual harassment applies to California businesses that have one (1) or more employees. FEHA discrimination, harassment and retaliation laws apply to businesses that have five (5) or more employees. FMLA leave of absence requirements apply to businesses with fifty (50) or more employees within a 75 mile radius. There are many other laws that may affect your business depending on its size. It is important to include laws that apply to your company. It is equally important to exclude laws that do not apply to your company. As provisions in an employee handbook can be used against an employer, it can also protect the rights of the company. A properly written and thorough employee handbook should contain a no-tolerance to drug and alcohol provision, no expectation of privacy provisions, safety and other provisions that allow an employer to take precautions against employees that are engaging in behavior that may be disruptive to the workforce. Moreover, an employee handbooks should designate the “at-will” nature of employment. At-will employment means that an employer can terminate an employee at any time and without notice and an employee can terminate his/her employment at any time and without notice. 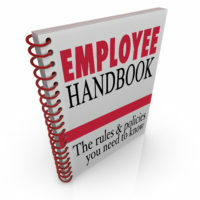 An employee handbook is a reference tool for both employers and employees. Employees should review the employee handbook to understand employee expectations and the policies of the company. Employers should be review an employee handbook prior to making important business decisions. As a good employee handbook is a reference tool, it is very important that it is up-to-date and carefully prepared. An employee handbook should be prepared by an experienced individual that understands the needs and limitations of the business.